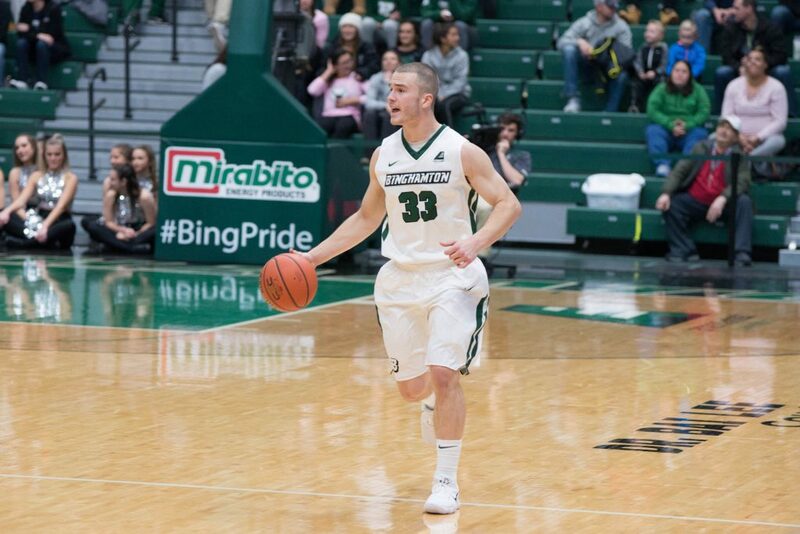 When the 2017-18 campaign ended for the Binghamton men’s basketball team, it was unclear what direction the program would take. With former forwards Willie Rodriguez, ‘18, and Bobby Ahearn, ‘18, graduating and pursuing professional basketball careers abroad as well as former guard Fard Muhammad rather abruptly transferring, BU head coach Tommy Dempsey was left with a core of two — senior forward Thomas Bruce and graduate student guard J.C. Show. Show, a 6-foot-3-inch Clarks Summit, Pennsylvania native, has been instant offense since transferring to Binghamton two years ago. After averaging 13.3 points per game while only appearing in 12 contests in his inaugural season, Show followed up with 13.8 points per game while improving both his free throw percentage and 3-point percentage as the team’s starting point guard. Although he has typically taken over the team’s playmaking duties throughout his career, Show expects to see more time at the two due to the addition of freshman guard Sam Sessoms. Sessoms, along with junior guard Richard Caldwell, Jr. and graduate student forward Chancellor Barnard, headline the new faces Show will be sharing the hardwood with. Considering the tumultuous season the team had last year, a new group of Bearcats in the locker room and on the court already appears to have had positive effects on the veteran guard. With a lackluster 2-14 record in conference last year, there is certainly no shortage of areas of improvement for this team. In the absence of glass eaters such as Ahearn and Bruce, who is recovering from a concussion, Show is well aware that he will have to shoulder a heavier load in the rebounding department. Even though he only averaged 3.7 boards per game last year, the shorthanded frontcourt will undoubtedly look to Show to corral long rebounds for the time being. Although struggle would be an understatement to describe how BU performed in America East play last year, the team did pick up quality victories in the nonconference portion of the schedule. Wins over Colgate and Army featured Show commanding the offense as he posted 19 points and 16 points, respectively. Even though those programs do not even come close to matching up to the national powerhouses such as Michigan and Notre Dame, whom the Bearcats are set to face off with later in the season, Show is focused on one game and one game only until then. Despite drastic changes in the starting lineup, as well as the general makeup of the team, it will definitely be interesting to witness how the team responds. As the captain of this squad, Show seems unwilling to let anything come in the way of Binghamton’s success on the court.